Trixie, clearing out a drawer in her dresser for Honey's things, glanced out of the window and saw her friend coming. She flung up the window to yell a welcome to her, but as she did, and with the words, "I'll be right down!" still unspoken on her lips, she stared in silent surprise. Brian, looking dark and handsome, as usual, and wearing his new cashmere sweater and best trousers, was hurrying down the path to meet Honey. 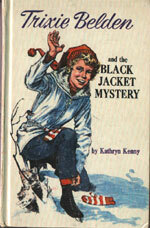 Close at his heels, also slicked up and wearing his sharpest ski sweater, went Mart. Even at this distance Trixie could see that he was trying to overtake his longer-legged brother and be the one to help Honey carry her bag. Brian won. He took the bag and got a sweet smile as his reward as he and Honey headed up the path together. But Mart wasn't left out. He promptly too his place on Honey's other side, and Trixie giggled as she saw him take over the conversation. The ghost writer of this book is unknown. 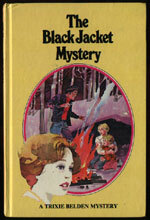 It is not thought to be Stack, but a later book by Stack, The Happy Valley Mystery, makes many references to this book. Luke - a member of Dan's New York gang, The Cowhands. He broke into the clubhouse, assaulted Mr Maypenny and was planning on robbing Manor House. 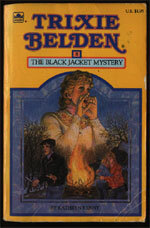 Regan gets a first name in this book - Bill (p. 17). Up until now, it had been safe to assume his first name was Regan as all the Wheeler's staff are called by their first names. 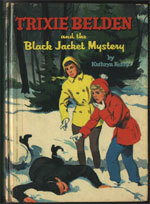 Aunt Alicia becomes Mr Belden's sister in this book (p. 28). 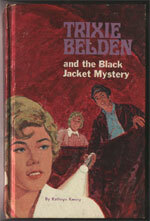 In a past book, she was said to be Mrs Belden's sister. Both Mart and Brian are rivals for Honey's attention, dressing up to impress her and fighting to carry her suitcase. Honey tells Trixie that Regan had to send money to his sister to help make ends meet (p. 33) but later in the book, Mr Maypenny tells them that Regan and his sister were brought up together in an orphanage and he hadn't heard from her since she ran off to get married (p. 189). So either Honey was wrong, or the author contradicts herself. Dan's father is called Tim and was killed in a car accident. The Wheeler's have a horse called Thunderer. It is not mentioned again in later books. 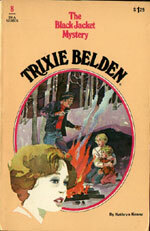 Mrs Belden apparently sings in a choir, as Trixie says that Moms has choir practice (p. 95). The Sleepyside Police force has a Police Chief Moran (p. 134) and Sleepyside apparently has a new doctor, "Doc Tremaine" (p. 171). 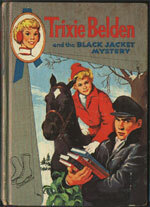 The author tells us that the Wheelers bought Susie for Trixie to ride with Honey, when originally the horse was bought for Miss Trask and previous Campbell books enforced this. In the previous book, The Mysterious Code, Regan installed an alarm in the clubhouse. The clubhouse was broken into in this book. Had the alarm been disabled or did the author simply forget? The ice carnival is held on Saturday, the 27th. 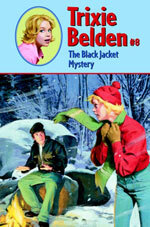 In the Mysterious Code, Di has a pre-Valentine's Day party, so it seems that this book would probably have been set in March.